You know your dealership is tight on floor space. Those tires, engines, fenders, filters and other common replacement parts all need a home; but where to store them that will be out of the way, yet improve the overall workflow and efficiency of your staff? You know you could add on to your dealership, but that’s a costly investment and it will take a significant period of time to complete. You need space now. Growing pains like these are fairly common among automotive dealers nationwide, but our top two strategies below could extend the life of these facilities for years to come. 1) Look up, not out, for space. When assessing your facility’s options for adding space, the first thing to consider is whether upward expansion is a viable option. If it is, then the obvious choice is to build up with a mezzanine platform. Mezzanine platforms are a great solution to fully utilize overhead space, as they can be custom designed and installed in a matter of weeks, and at a fraction of the cost of new construction. 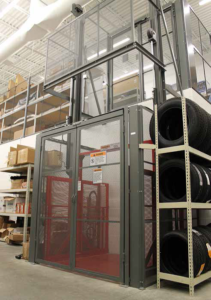 For automotive facilities, the installation of a mezzanine creates additional space for tires, body parts, large bulky items, files, work stations, offices, or various storage area you may need. In addition, free standing mezzanine platforms offer tax advantages through accelerated (7-year) depreciation since they are recognized as capital equipment. 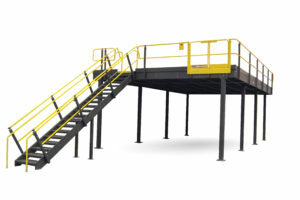 A well designed platform can be built to meet your exact specifications and application requirements. 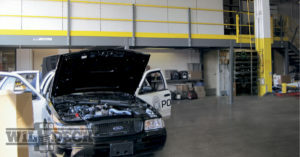 If you’re wondering what works best for your application, consider an onsite visit with a Wildeck® automotive specialist to determine your facility’s needs. If you are in the planning stages of a new facility, engaging with one of these experts early on could help you make the most out of your vertical space. Hundreds of automotive dealerships just like yours are enjoying the benefits of valuable floor space that they thought wasn’t possible without a brick and mortar expansion – through the use of a mezzanine. For automotive dealers that have already maximized their footprint with multiple levels, the next question should be how to move their materials most efficiently to that elevated level. While manual labor may appear to be the least expensive option, this may not necessarily hold true. Carrying large/heavy automotive parts and equipment upstairs creates opportunities for injuries over time, which can quickly result in high costs for your facility and loss of productivity. We suggest a safer alternative that performs the material lifting for you – a Vertical Reciprocating Conveyor (VRC). A VRC material lift will transfer your most cumbersome auto parts and equipment to your second level with a push of a button, while removing forklifts entirely from the equation. Because they are for material use only (passengers are prohibited), they are much less costly to operate and maintain than a typical elevator; providing you with a much quicker return on your investment. VRCs present less upfront costs than a passenger elevator, and the potential to prevent worker injuries. They are unquestionably one of the safest and most efficient ways to move materials from one floor level to another. When it comes to expanding your facility, new construction isn’t always the answer. Often times, there are better ways to maximize your space, and the difference could save you thousands of dollars down the road. The next time you are looking to tune up your automotive facility, contact a Wildeck® automotive specialist to see if a mezzanine platform and material lift (VRC) are viable options for you. Scott Dachel is the Senior Regional Sales Manager at Wildeck, Inc. He can be reached at 800-325-6939 or sdachel@wildeck.com.